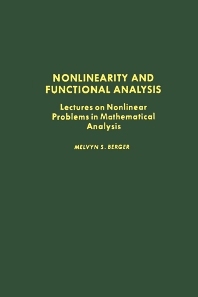 Nonlinearity and Functional Analysis is a collection of lectures that aim to present a systematic description of fundamental nonlinear results and their applicability to a variety of concrete problems taken from various fields of mathematical analysis. For decades, great mathematical interest has focused on problems associated with linear operators and the extension of the well-known results of linear algebra to an infinite-dimensional context. This interest has been crowned with deep insights, and the substantial theory that has been developed has had a profound influence throughout the mathematical sciences. This volume comprises six chapters and begins by presenting some background material, such as differential-geometric sources, sources in mathematical physics, and sources from the calculus of variations, before delving into the subject of nonlinear operators. The following chapters then discuss local analysis of a single mapping and parameter dependent perturbation phenomena before going into analysis in the large. The final chapters conclude the collection with a discussion of global theories for general nonlinear operators and critical point theory for gradient mappings. This book will be of interest to practitioners in the fields of mathematics and physics, and to those with interest in conventional linear functional analysis and ordinary and partial differential equations.